***This is a cross post from our lead technical developer @haxpor. The post contains much of information about why there’s not much activity going on in the past several weeks of Zombie Hero development. Check the original post here to centralize the comments. I do think I should post this directly to Zombie Hero Devlog but it’s much more to be my personal stuff and dramatic confession. So posting here and do a cross-post there would be a better idea. It’s more than half a month now since last post showing off works from @kumsmkii back on 15 July but it’s a whole month for no major progress on a game “Zombie Hero : Revenge of Kiki” itself. Things get done pretty slowly. The main reason comes from me spinning down quite reasonably enough to not get any significant things done in a past several weeks. In addition to switching to do other activities ie. doing music performance (I’m at the far side) , organizing indie gamedev meetup (proof, me sitting nearest side), attending 3 commencement / graduation events of my friends, and dealing with personal relationship thingy (yeah, I met someone) with a hope to be refresh then come back alive and ready to continue, but no, I want to do those things more. With a careful counting, it has been around 5 months worth of work starting in January. Then it starts to get stinky in July which was what I were facing for the whole month. Working remotely would be one of factors, but I look at it normally. It’s not an option for us to pack together in one place as transportation cost would be too high, and each of us has to deal with his own activities going on in day-to-day basis. Only 5 code commits have been pushed since the start of July. All of them are possible to be done within a couple of days. The changes are as follows. Added new being-hit action to Kiki when it’s hit by bigger type of zombie. Fixed volume adjustment approach to use normal “gain” property. Updated new modified pitch-value sfx, and added new boss fight background music. Fixed one of major bugs rarely found during boss fight. I have to admit that it’s not so healthy as we have to be prepared for upcoming Tokyo Game Show next month. It’s coming closer. Now I have time worth a month and a half to get things done before we will get embarrassed in front of the japanese and oversee crowd in the convention in Tokyo if the game cannot reach acceptable of completeness level. 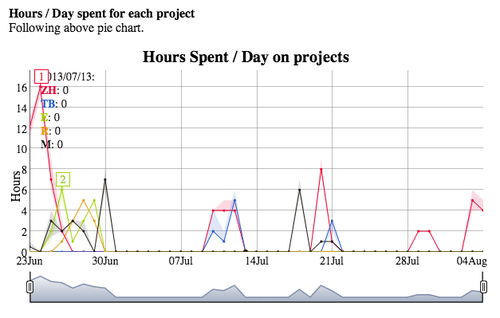 I’ve started to track my hours working on something, project tracking, since 22 June. I planned out roughly for hours investment distributing for things I’m currently doing. Then during my implementation on those activities, I manually count hours spent for each one. Yep, with some small errors but it’s not significant. Red line is what I’m focusing. It’s high for a day then down, spike up for some time, then down, and then recently it just went up for the sake of my awareness triggering that I should do something to get back up. It seems like the whole month gone without major things get done. Line graph color maps to the color in pie chart above. All in all It’s not impressive at all but I take that as a truth statistics. So back to other updates of Zombie Hero. Juries of IndieCade which were assigned to review our game installed our game on 29 July thus the game probably has 1 full week for them to review. The reviewing process has ended now. We will know the result whether the game will be selected as a finalist by 30 Aug.
We still didn’t receive feedback back from our first publisher we’ve talked to since 3 July. We still have no idea how long it would take. But anyway, right now we push all focus into TGS and that is to make progress to the game as much as possible.We also have planned and marked which ones to talk to next as well, but it’s not the right time just yet as the game doesn’t get passed the certain completeness level. To all followers of Zombie Hero, it’s my responsibility to finish this game. So I add the following piece of information as a token for my absence. See below. More importantly, I’ll get back to it right now. Almost all of builds below are used for our own team to test and follow up on any feedback might should we improve for build-to-build. Some of the same builds are used for press. An official first build of the whole development since the start of development cycle on Oct 18, 2012. 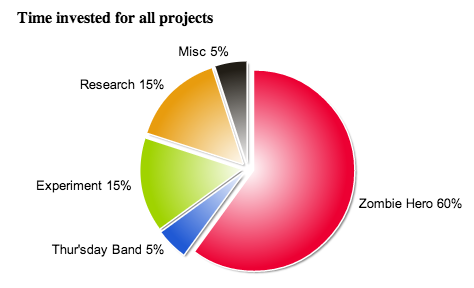 From Oct til the end of 2012, we’ve experienced much of frictions and delays due to during that time I’m working on something else and didn’t fully commit to Zombie Hero. - Added support of .ttf font rendering, and ability to pause the game. - Pixel bleeding suffered from “Sprite Spacing” is *virtually* solved (see March 5). - First build to append REVISION BUILD to the version number. - Added force feedback when hit. - Effect is added for attacks. - ObjectPool class is implemented and used in the game to spawn various types of objects. - Several bugs fixed and improved things. - Added filling combo for more fluid combo performance. - All characters are half-size asset. - Re-exported all asset with TexturePacker. This is the time we purchased TexturePacker license and switched from Zwoptex which causes un-optimized problem and pixel bleeding. - Spawning zombies ability is added using template + type traits code style. - Optimized all sfx and music with .caf format. - Added spinning in mid-air being-attack action. - Firstly added mid-air combat. Kiki can perform combos either from the ground to mid-air, it’s continuity. - Added seamless combo combination. All combos can be chain together seamlessly. - Fixed leak bug from hit-effect fast spawning / disposing. - Initially cached some actions of Kiki to optimize code and solve timing problem. - Fixed a couple of bugs. - Added range combat zombie. Zombie can shoot at us now! - Fixed bugs and refactored code. - Updated with set 2 of sfx / music. We have incremental update of sfx / music on the go. - Fixed positioning on map level to make it consistent with iPad version. - Fixed a bug relating to positioning after get back from spinning in mid-air. - Fixed positioning in spawning new zombies. - Upgraded XCode to v.4.6.1, and fixed errors generated due to upgrade. - Added support for certain possible range of character scaling factor. - This is a workaround build in which we just increased the number of build to resolve the issue of TestFlight SDK we integrated. Everything else is the same. - Improve interaction experience in using joystick. - Added reset. At first we only have exit button thus to restart the game, we have to close the game first then start it again. - Fixed launch image not appeared on all devices. - Un-integrated TestFlight SDK and removed all of its related files. - Integrated Flurry Analytic SDK via AnalyticX Wrapper. - Virtually (code ready) added all worlds. - Added flocking algorithm (AI) and it’s firstly used with Yankee zombie. - Improved a feeling of walk and walk-fast animation of classic zombie. - Added an ability to scroll in y-direction of the level. This really adds more depth into the game. - Modified cocos2d-x framework to support scene switching management. - Updated hit-effect for weak and hard attack of Kiki. - Added randomness of flipping in x-direction for hit-effect when it get spawned. - Added normal incarnation asset of Kiki. - Added more new hit-effect. - Added a first boss, mask hero. - Added more game screens which are splash, credits, result, and pause. - Added intro and outro cut-scene story for Prologue storyline. - Fixed several bugs and improved several things. - Added more different punch animations. Firstly we have only 1 punch animation, it’s plain and dry when we use it often as Kiki still punches with the same momentum and behavior. Adding more would make it more fluid and looks good in overall animation progression. - This is a workaround build in which we just increased the number of build to resolve something probably relates to seeing whether Flurry update is sane and pushed to server. - Added spritebatch node for character’s shadow. This improves rendering calls. - Fixed “Touch to Play” to actually shows first then we can touch to play. - Added more cached actions of Kiki. - Fixed a major bug of everything just disappear randomly. It’s because of one of math operation dividing by zero occurs. Thus position calculation was broken and everything seems to be hidden. This bug plagued us for so long since day one. From time to time when we roll out build to other on site, the really unlucky thing is that they hit this bug! - Fixed Kiki’s major bug of state messing after being died. - Updated role text in credits screen. - Added shaking effect to one of combos left un-added. - Made virtual joystick transparent. We got this feedback from french gaming media guy who played test our game. We agreed on the subject. - Fixed tutorial position popup. - Added random direction to all spinning in mid-air being hit action. - Added floor breaking effect for one of our ultimate attack. - Switched to use .pvr.ccz for all of our spritesheet. - Updated all characters to use RGBA4444 format. - Added character avatars in intro and outro cut-scene. - Improved cut-scene to progress more smoothly. - Added more character avatars in cut-scene. - Patched cocos2d-x framework with content protection feature of TexturePacker. - Re-exported all cut-scene asset with encryption key. - Changed the game to support both left and right landscape for both iPhone and iPad. - Fixed and improved several things. - Fixed red flash hit effect still appear after being hit for both enemies and Kiki. - Added multi-touch support when try to activate ultimate attack. - Added big zombie prototype. - Fixed volume adjustment to use “gain” instead of changing its global volume especially for sfx. - Updated all new pitch-modified sfx and new boss fight background music.